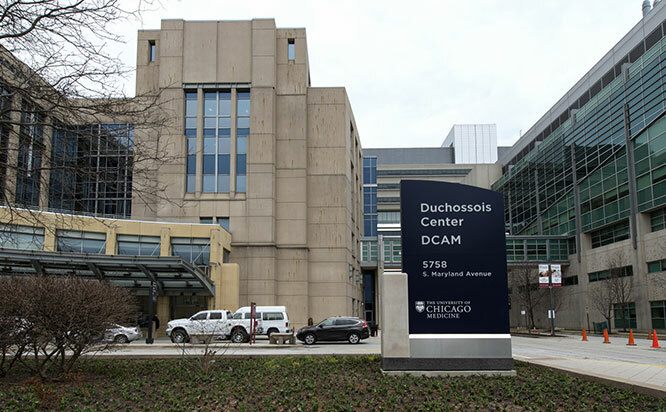 UChicago Medicine Duchossois Center for Advanced Medicine - Hyde Park, also known as DCAM, is our flagship outpatient facility. Located in Chicago's historic Hyde Park neighborhood, this six-story building puts comprehensive diagnostic care and world-class treatment under one roof. Home to dozens of primary and specialty clinics as well as a pharmacy, the building includes more than 300 exam rooms, nearly 100 procedure rooms, surgery suites and imaging equipment including PET/CT and MRI scanners. It also has facilities for nuclear medicine along with linear accelerators and simulators for radiation therapy. DCAM brings the knowledge and resources of UChicago Medicine to the outpatient setting, including clinical trials in virtually every medical area and more research funded by the National Institutes of Health than anyplace else in Illinois. The DCAM Outpatient Pharmacy now provides Specialty Pharmacy services. You can reach the University of Chicago Specialty Pharmacy at 773-834-2285. To be eligible to participate in an e-visit, you must be located in the state of Illinois and have had an office visit at an applicable UChicago Medicine primary care location center within the past three years. E-visits are managed from 8 a.m. to 5 p.m. Monday through Friday. We will respond to requests within one business day. If you have a non-urgent issue, you can message your care team through MyChart or call the Primary Care Group at 773-702-6840. If you have a more urgent medical need that requires same day follow up, call the Primary Care Group at 773-702-6840. If you are experiencing a medical emergency, you should go to your nearest emergency room, or dial 911. Ask your UChicago Medicine provider for additional details about online e-visits. We offer a variety of convenient parking options, including valet and self-parking option in our two parking garages, along with street parking and nearby public transit options. Our outpatient pharmacy provides information enabling you to receive the full advantage of your prescription pharmacy benefit.